Ghost Upon the Floor: I miss October. I miss October. When November 1 rolls around, and the last of the discount sales have ended, giving way for the endless, instant parade of Santas and reindeer and Snowmen that December brings, I get a little sad. Since childhood, I have loved Halloween. All things October. The fall, the harvest, the cooling weather the colors bursting on the trees. Coming home with some apple cider on a cool, breezy fall night to watch a black and white Boris Korloff as Frankenstein's monster on TV. I can't explain it, but there are so many of us out there, who love the orange and the black and the telling of ghost stories. So. I decided to start a blog for myself, keeping track of all I see and do throughout this Halloween season, which has already officially gotten underway. It's August, and the first piece of the season I saw two weeks ago was in Price Rite, a simple stack of 2 Musketeer boxes with a greenly lit nighttime scene of a gate and castle. And a week and a half ago, at Kirkland's in the mall, my partner and I found a Halloween display. I bought a door mat, which I will take a picture of and post. Since then, I have been inspired. My holiday goals for this year are the usual decorating and pumpkin carving, as well as my new goals of baking dozens of Halloween cutouts and growing my own pumpkin. I plan on documenting all of this here. 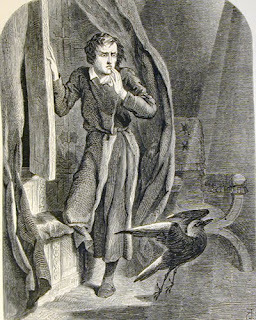 I had wanted to name this blog "Midnight Dreary," a phrase from one of my favorite, not neccessarily Halloween-related poems, Edgar Allan Poe's "The Raven." However, that name was taken; so, upon scanning the poem, the phrase "wrought its ghost upon the floor" struck me and reminded me just how beautifully woven Poe's words in the poem are. And so you have it.